I can't believe that today is the last day of 2017! This year has gone so quickly - particularly these last couple of months. Anyway, as it is the last day of the year I thought it would be appropriate to round up the year (and my favourites posts) with my favourite nail art from this year. The last couple of months I feel like I haven't done much nail art but the first three quarters of the year was a different story. This is going to be another lengthy post (sorry) but I have done my best to narrow my favourites down to twenty three manis. I know that is still a lot but I have done a lot of manis this year. Like with my previous posts, these aren't in any particular order. Right, now on to my favourites! There is something about really simple manis that I just love. I am also really happy with how well placed this design is. I usually struggle with layering and positioning designs. For this mani I used Emily de Molly Bring The Light (this polish also made it into my favourite indie polishes for this year), Dance Legend's Violet Stamping Polish and Powder Perfect's Black Stamping Polish. 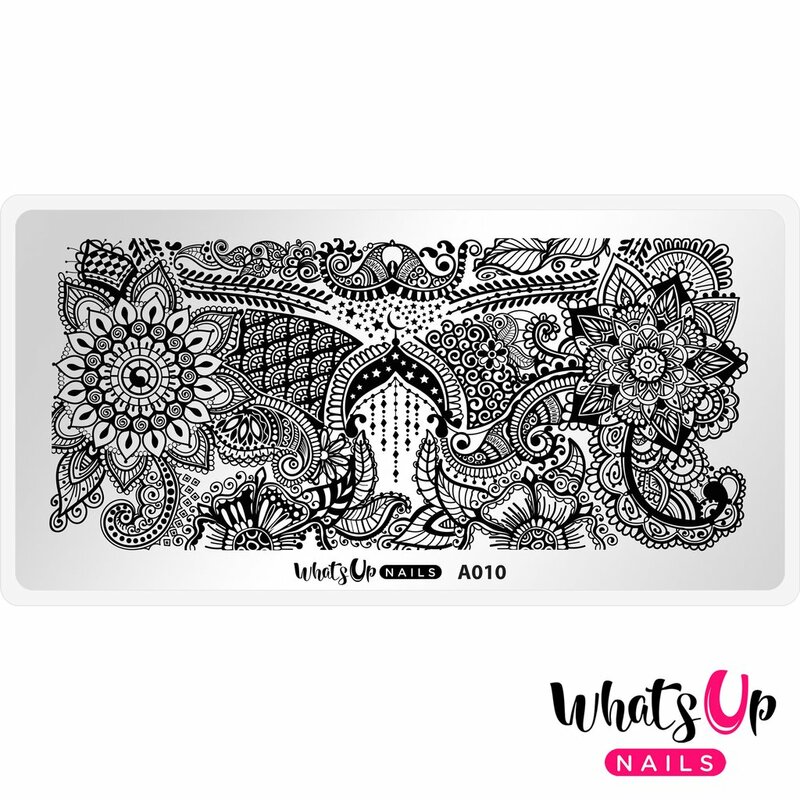 Image is from Lina Nail Art Supplies Feeling Shapely 01 stamping plate. This year I have been all about sponging on my backgrounds. I do have a tutorial for how I do this base here in case you are interested. For this mani I used piCture pOlish Mad Magenta, Chillax, Swagger and Gelato. Stamping is done using Powder Perfect's Black Stamping Polish and Lina Nail Art Supplies I Foil In Love 01 stamping plate. 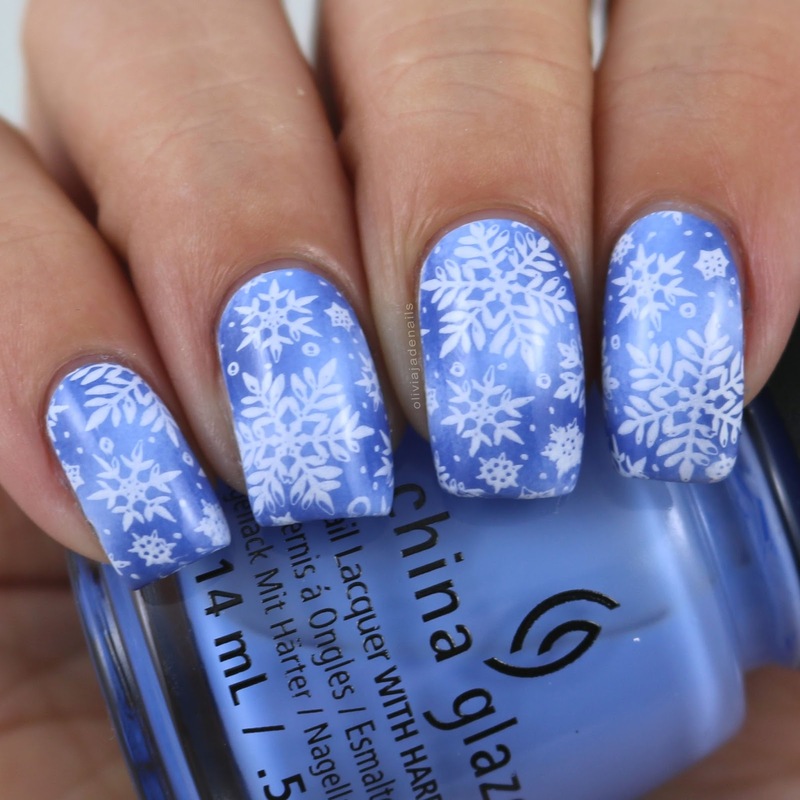 Snow isn't something that I have really experienced (we did have a small amount of snow once when I was at university) but I do love snow flake manis. For my base I sponged on Essie's Saltwater Happy and Pret-a-surfer, and China Glaze Boho Blues. Stamping is done using Powder Perfect's White Stamping Polish and Uberchic's Holiday Jingle stamping plate. As we know I love sponging on bases. Well for this mani I decided to try sponging over nail vinyls. I still love this mani. Polishes used are OPI's Alpine Snow (for my base), Essie's The Fuchsia Of Art, The Wall, Stencil Me In, In It To Wyn It and Mark On Miami. 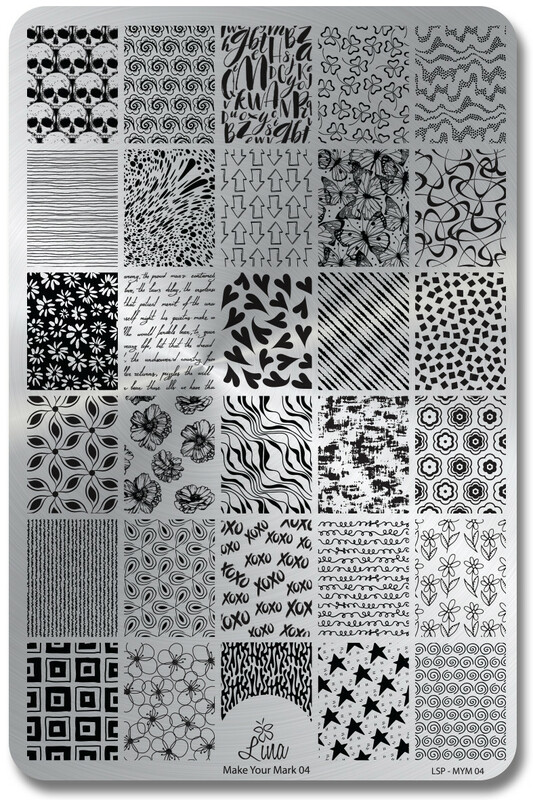 Nail vinyls are Xroma Polish And Vinyls Turtle Shell vinyls. Yes it's another sponged background with black stamping. It's somewhat of a 'signature' for me this year. For this mani I sponged the entire OPI Retro Summer Collection for my base and stamped using Powder Perfect's Black Stamping Polish. 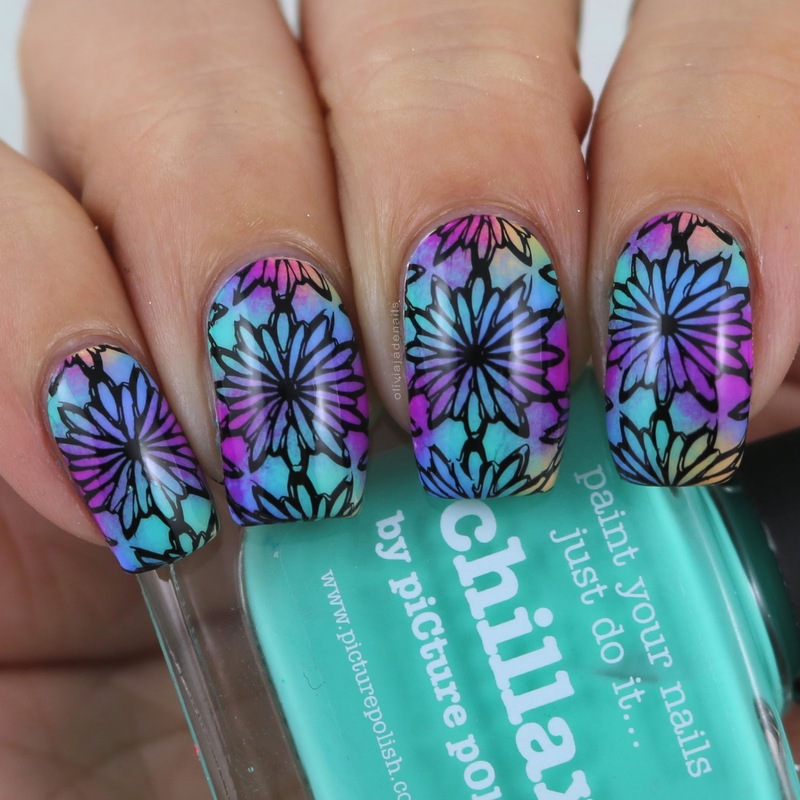 Image is from Uberchic 14-01 stamping plate. This mani is a mani that I recreated for a challenge I did earlier this year. The original mani was done by Ana's Manis. Polishes used are OPI You'r Such A Budapest, Flip Flops & Crop Tops and Love Angel Music Baby for the flowers and OPI Alpine Snow for the dots. I also mattified it using OPI's Matte Top Coat. 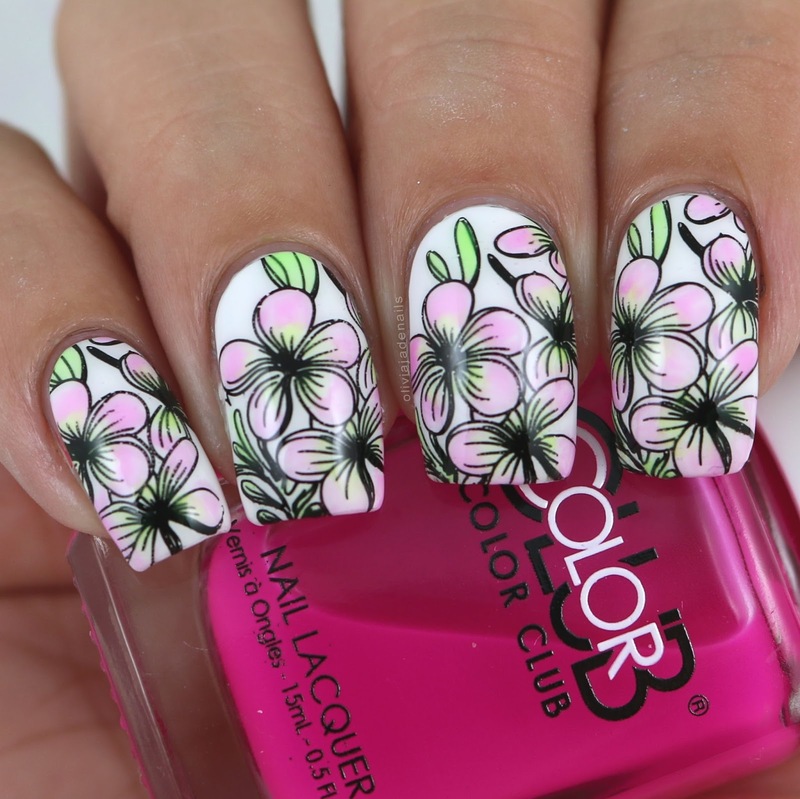 Floral manis are always going to be a favourite of mine. I especially love the colours in this mani (it's more vibrant in person). For my base I used OPI's Alpine Snow and stamped using Powder Perfect Black Stamping Polish. 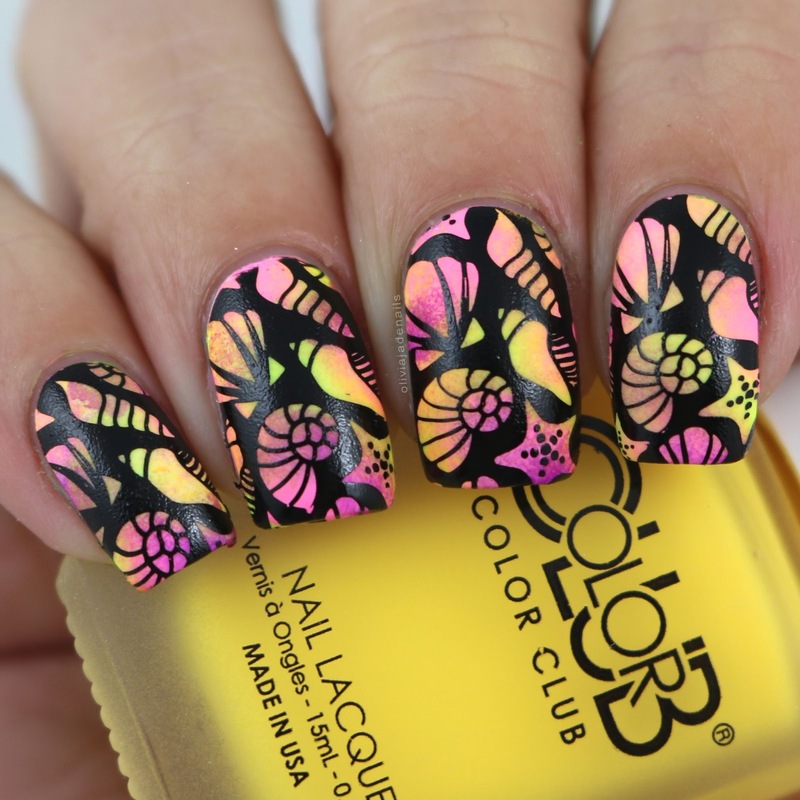 I then filled in the image from Uberchic 14-02 using Color Club's Just Dew It, Hello Sunshine and Tube Top (all from the Pop Wash Collection). This is one of my all time favourite combinations when it comes to a skittle mani. I have done it a few times over the last couple of years and I love it each time. Polishes used are China Glaze's Release and CG In The City, Pretty Serious Cosmetics Absence and Powder Perfect's Black Stamping Polish. 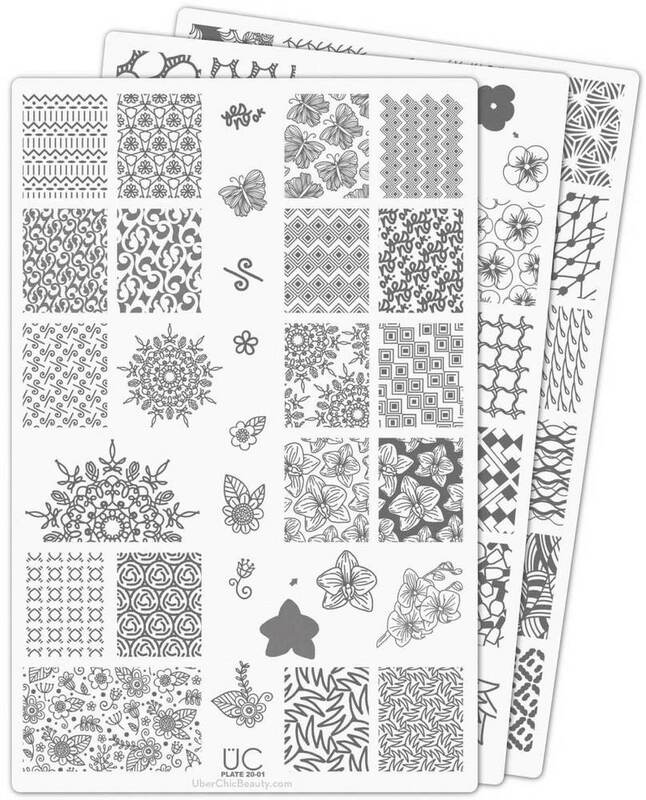 Stamping image is from Uberchic's 14-03. 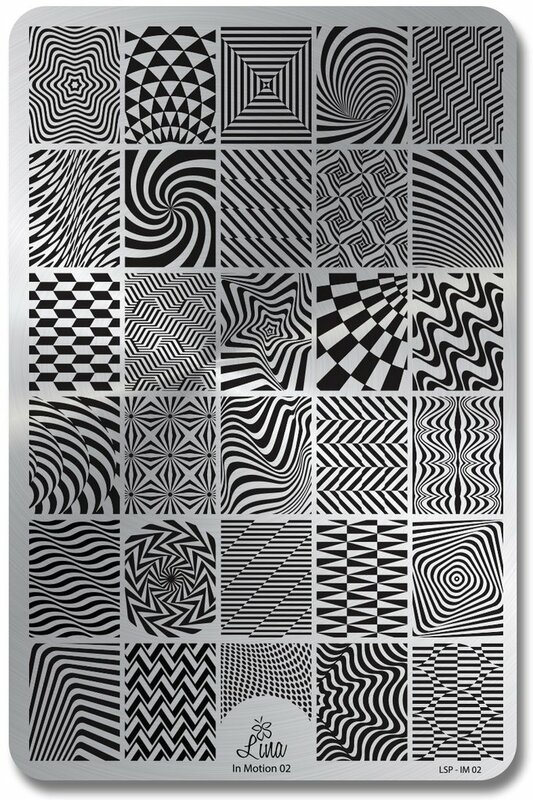 I really love layering different images over each other (as you will probably see in this post). 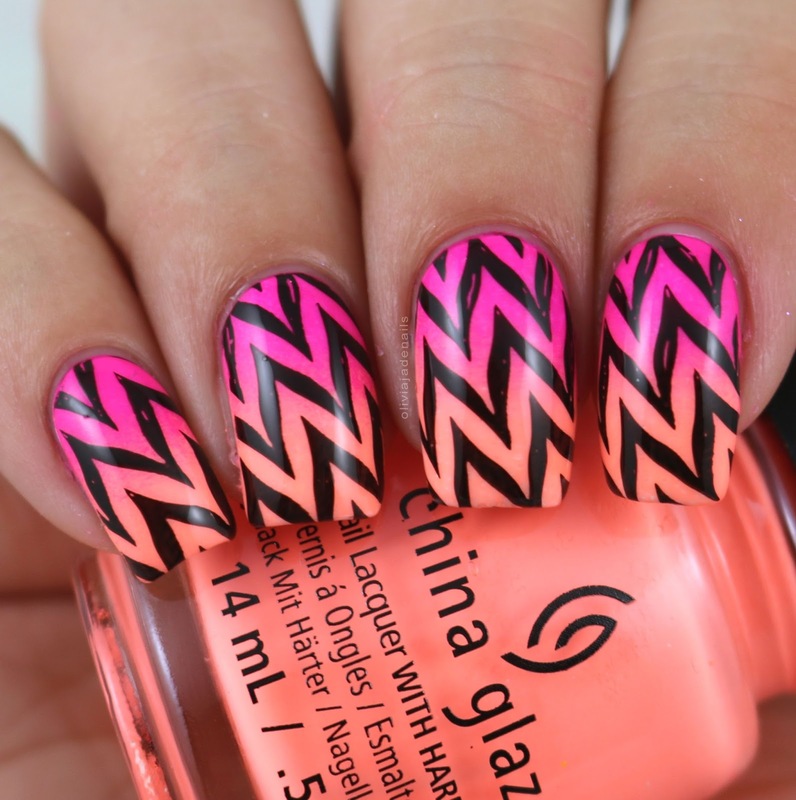 I really want to do this mani in a variety of colours at some point. For the base I used Dance Legend's My Wave and stamped using Color Alike B A Cobalt Kick, Bundle Monster's Cosmic Latte and Powder Perfect's White Stamping Polish. 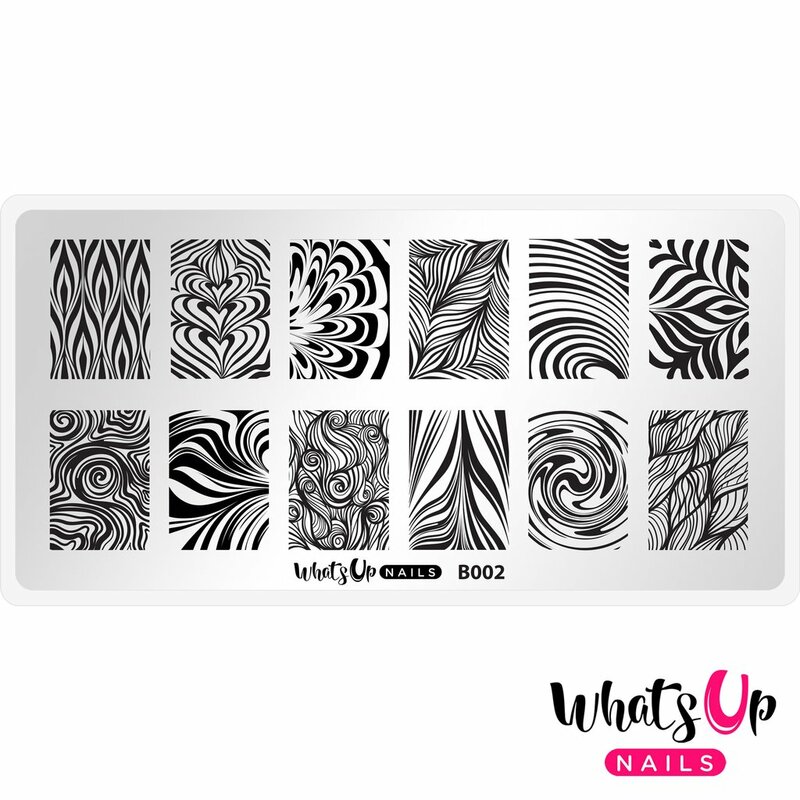 All images are from Lina Nail Art Supplies Make Your Mark 02 stamping plate. I love the base of this mani, just as much as I do with the black stamping - but in an effort to cut back all of my favourites I ended up taking it out of today's post. For my base I used OPI Alpine Snow then stamped the dotted image from the Make Your Mark 03 plate using B Loves Plates/Colour Alike B A Cobalt Kick, B A Fuchsia Flash and B A Yellow Glow. Finally I stamped over that using Powder Perfect's Black Stamping Polish. 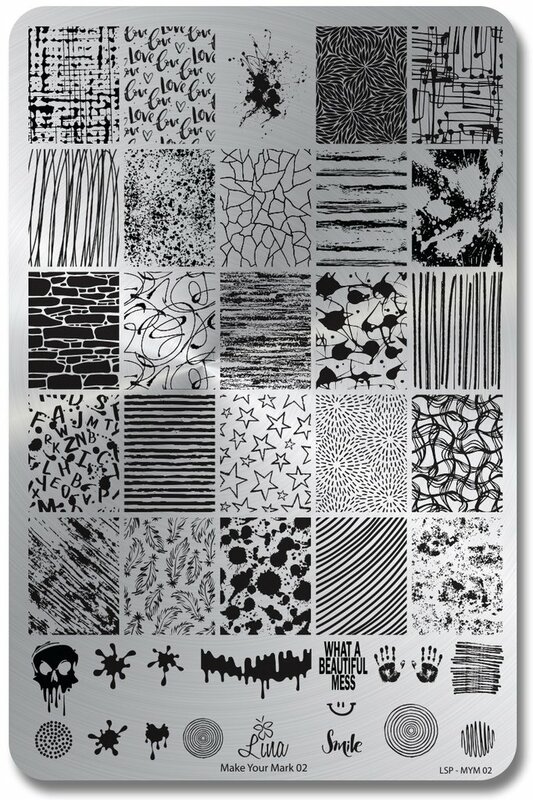 Image is from Lina Nail Art Supplies In Motion 02 stamping plate. You can never go wrong with a dry brush mani. It's just one of those easy techniques that always look good. I really should do them more. Polishes used are OPI Alpine Snow, China Glaze's Bottoms Up, Too Yacht To Handle, I'll Pink To That, Sun Upon My Skin, UV Meant To Be and Home Sweet House Music. I am a huge fan of layering images (even though I do struggle to layer them perfectly) and this is definitely one of my favourites. 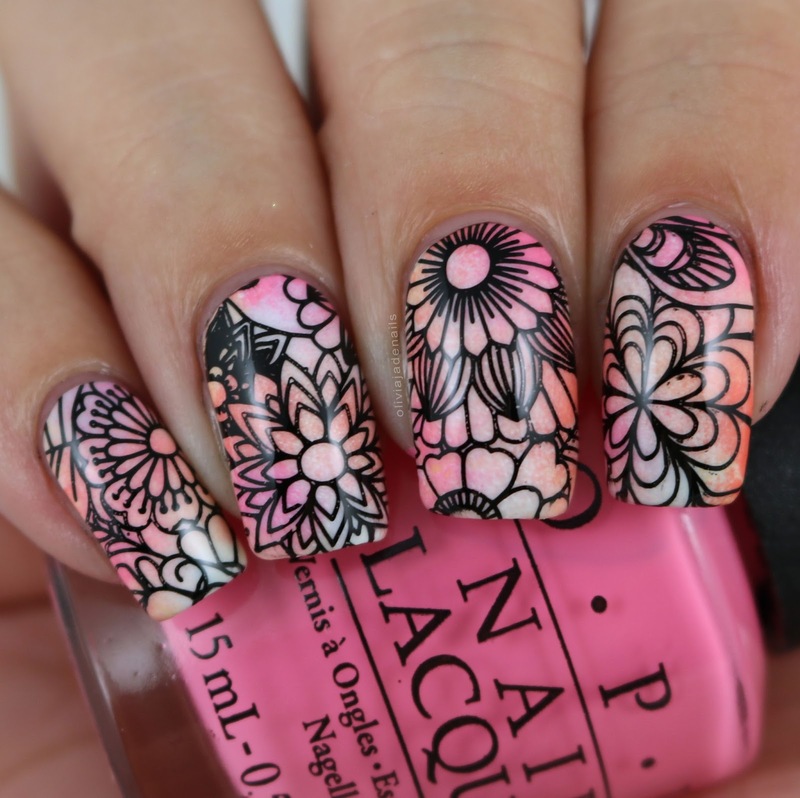 Polishes used are OPI Alpine Snow, Dance Legend's Pink Stamping Polish and Powder Perfect's Black Stamping Polish. 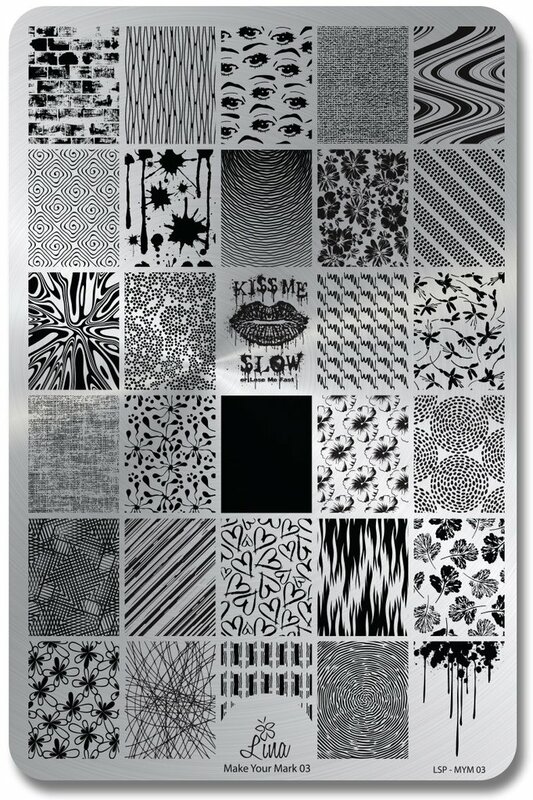 Images are from Uberchic 15-02 stamping plate. Texture-ish manis are always fun to do especially when they are layered. For my base I used China Glaze Blanc Out. I then stamped the first layer using Emily de Molly Light Grey, and the second layer using China Glaze Out Like A Light. 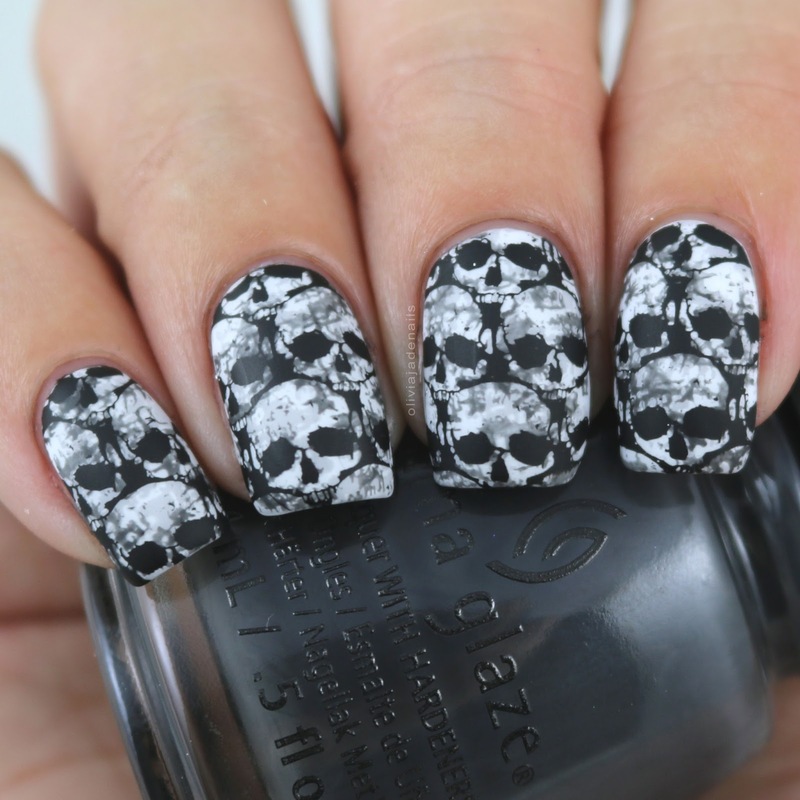 Finally I used Powder Perfect's Black Stamping Polish to stamp the skulls. 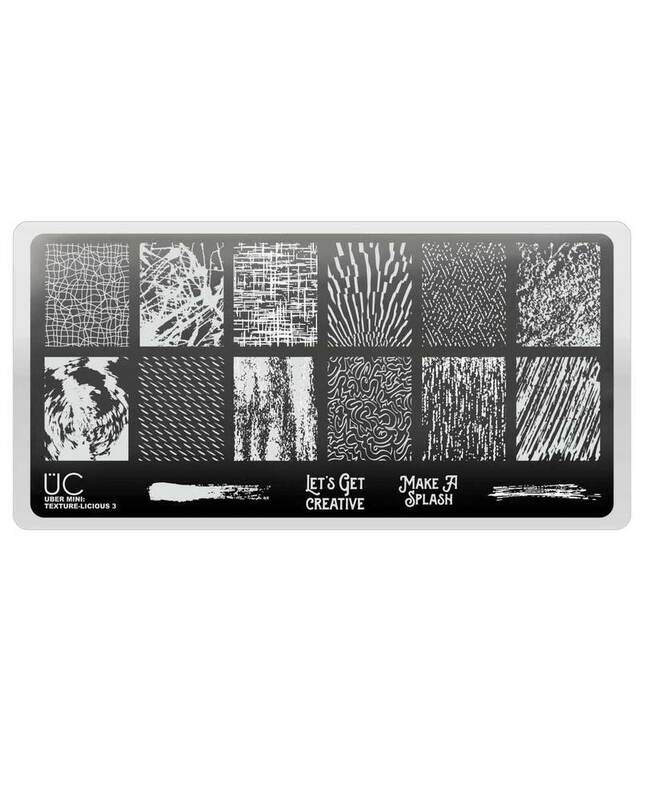 Images are from Lina Nail Art Supplies Make Your Mark 04 stamping plate. This butterfly image is probably one of my most used images this year. I actually had a couple of manis with this image that I could have included in today's post but this mani is my favourite of them all. 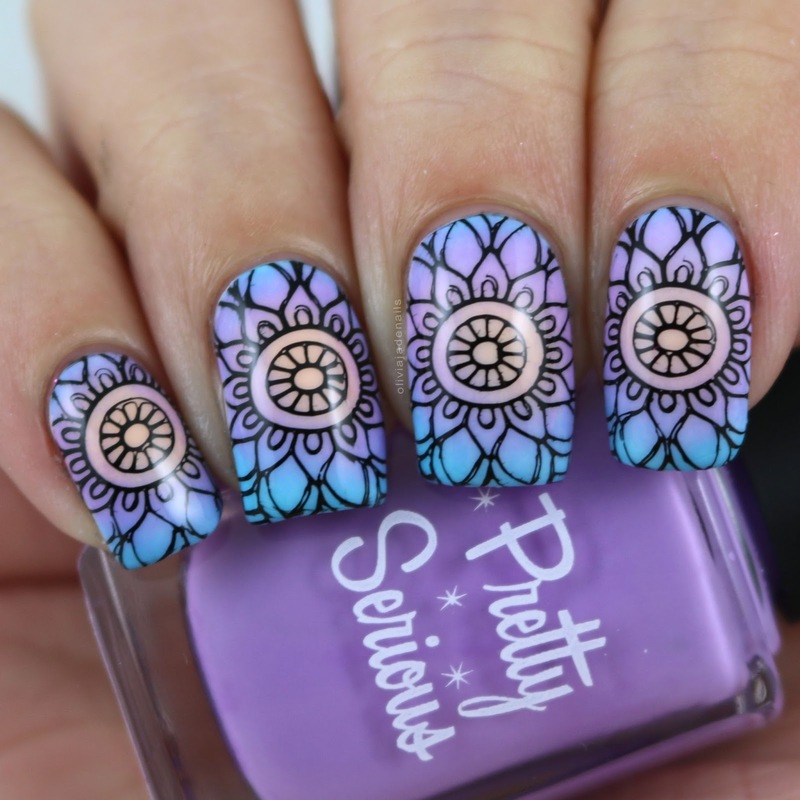 I used the entire Pretty Serious Cosmetics Pastel Pets Collection and stamped using Powder Perfect's Black Stamping Polish. 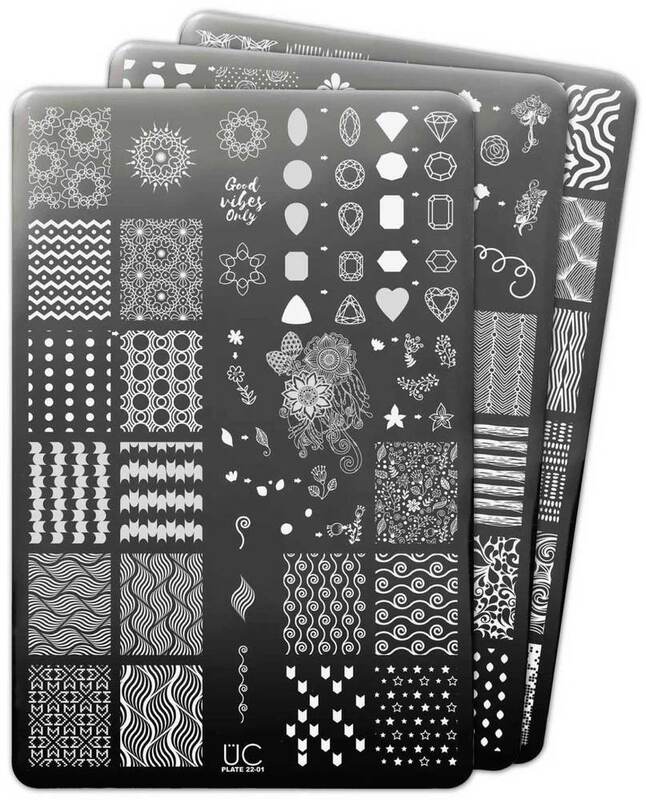 Image is from Lina Nail Art Supplies Make Your Make 04 stamping plate. I seem to always grab for brighter polishes but I also love my pastels as well. For my base I used China Glaze Chalk Me Up!, Lotus Begin, Belle Of A Baller, More To Explore and Casual Friday, and stamped using Powder Perfect's White Stamping Polish. 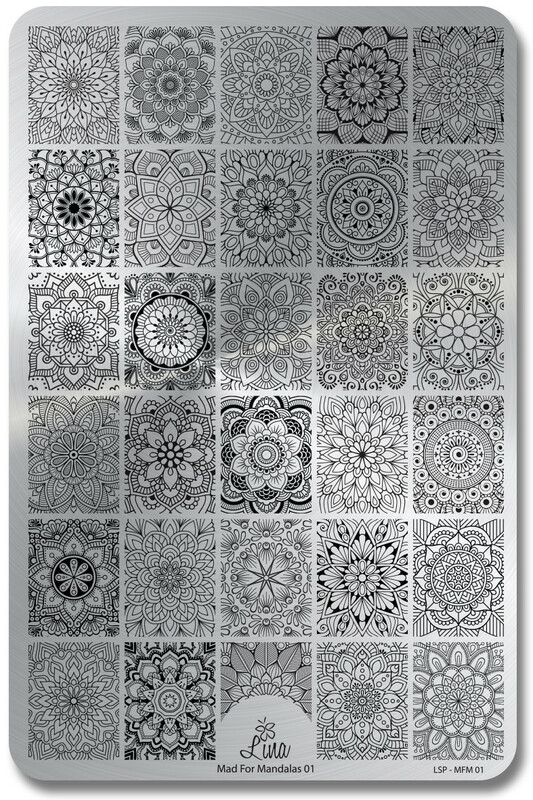 Stamping image is from Uberchic 18-01 stamping plate. 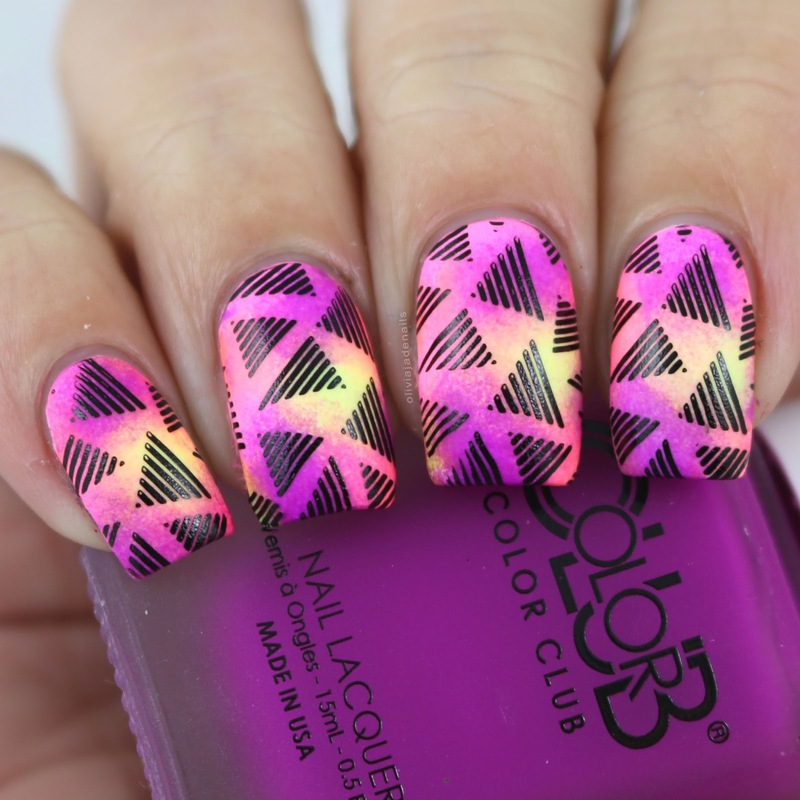 Sponged matte neon background with black stamping? 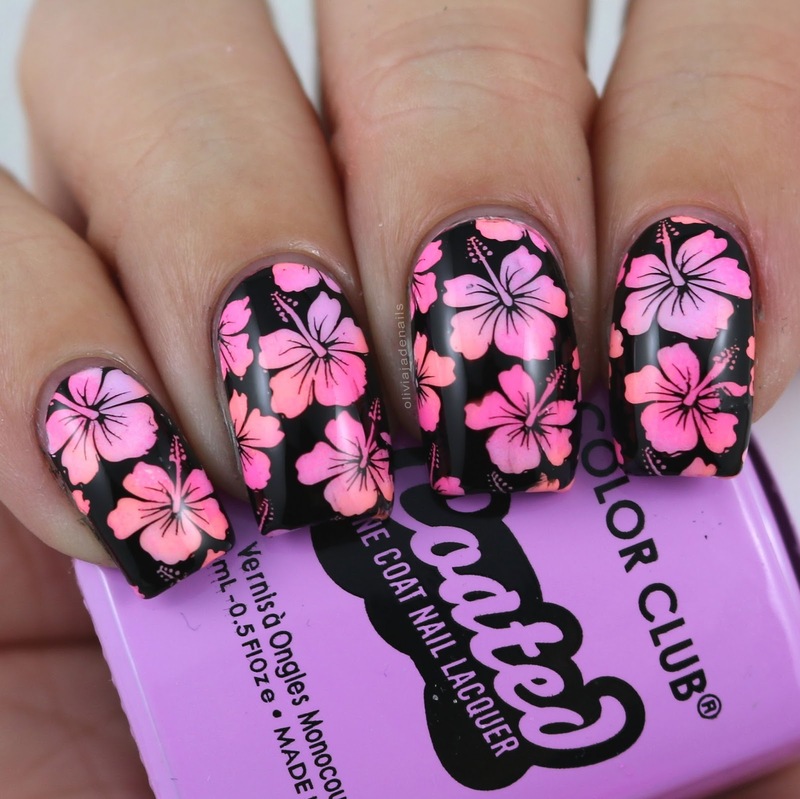 There is no way that this mani couldn't end up on my favourites list. For my base I sponged on Color Club's Friendzone, All Dolled Up, Having A Ball and Play Date. I then stamped using Powder Perfect's Black Stamping Polish. I decided not to add top coat over this because I really like the contrast between the matte base and the glossy stamping polish. I also like that it has a slight textured look that this mani has. 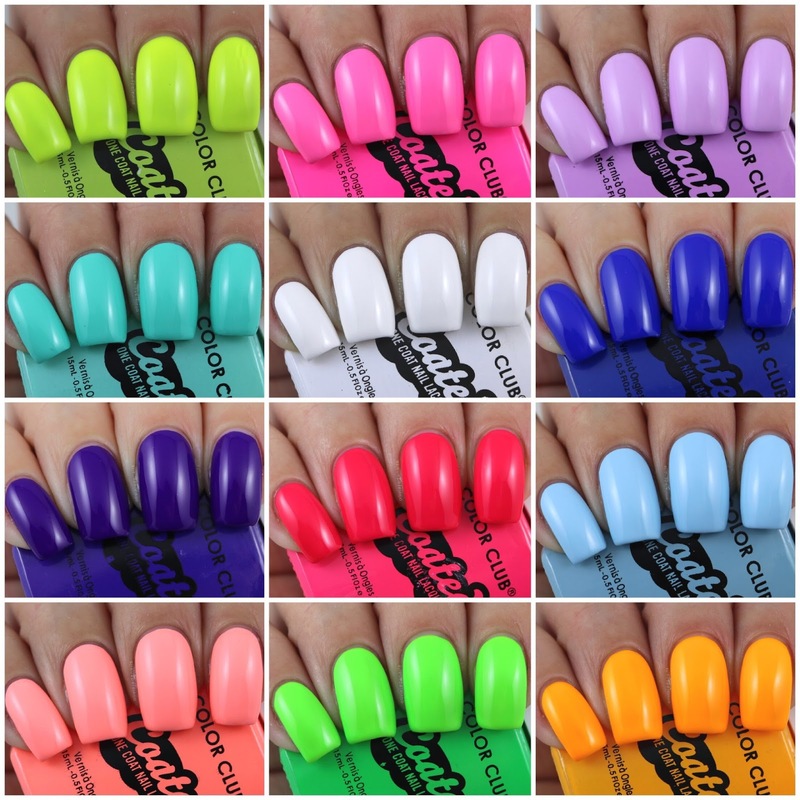 Matte neons are always a winner. Again I did a sponged base for this mani. 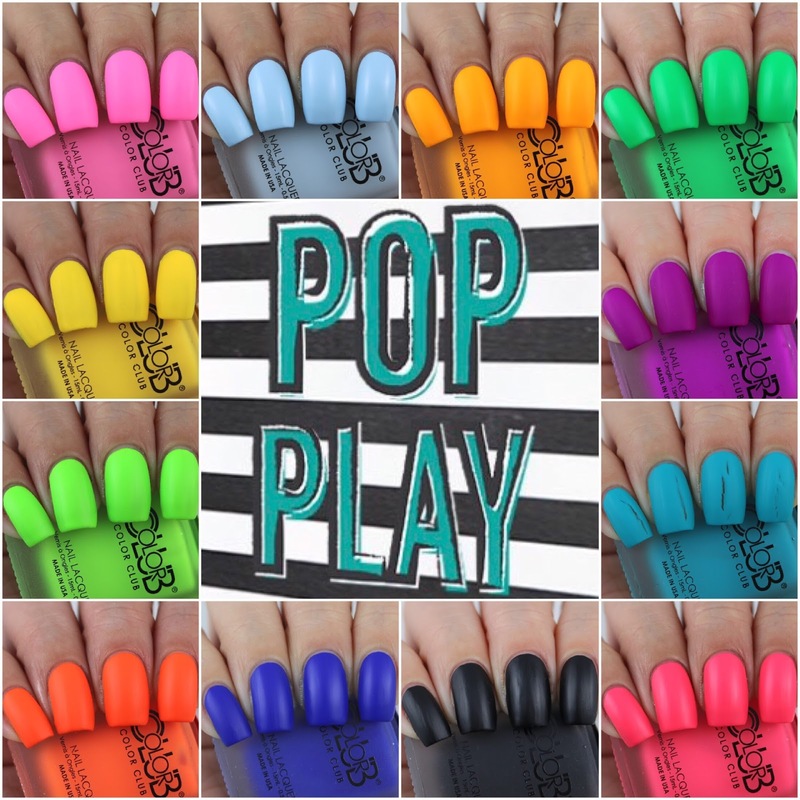 Polishes used are Color Club's All Dolled Up, Play Date, Study Buddy and Cliff Notes. 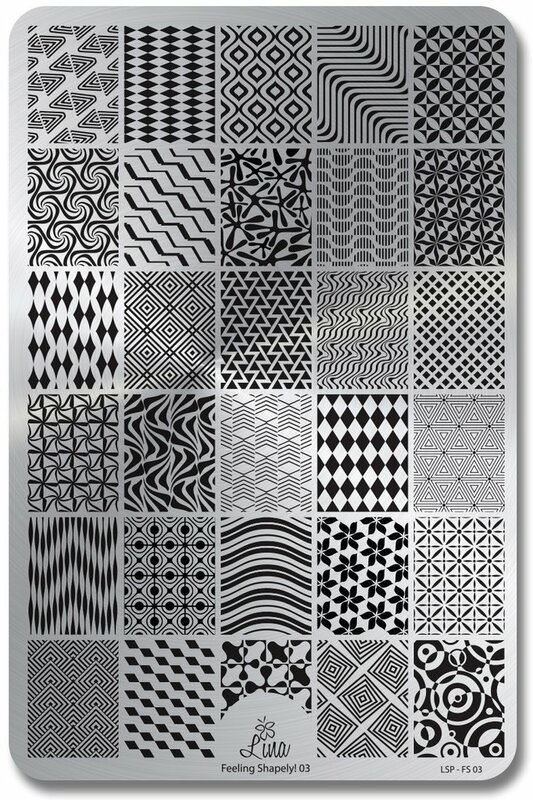 Stamping design is from Powder Perfect's 1980s Stamping Plate. 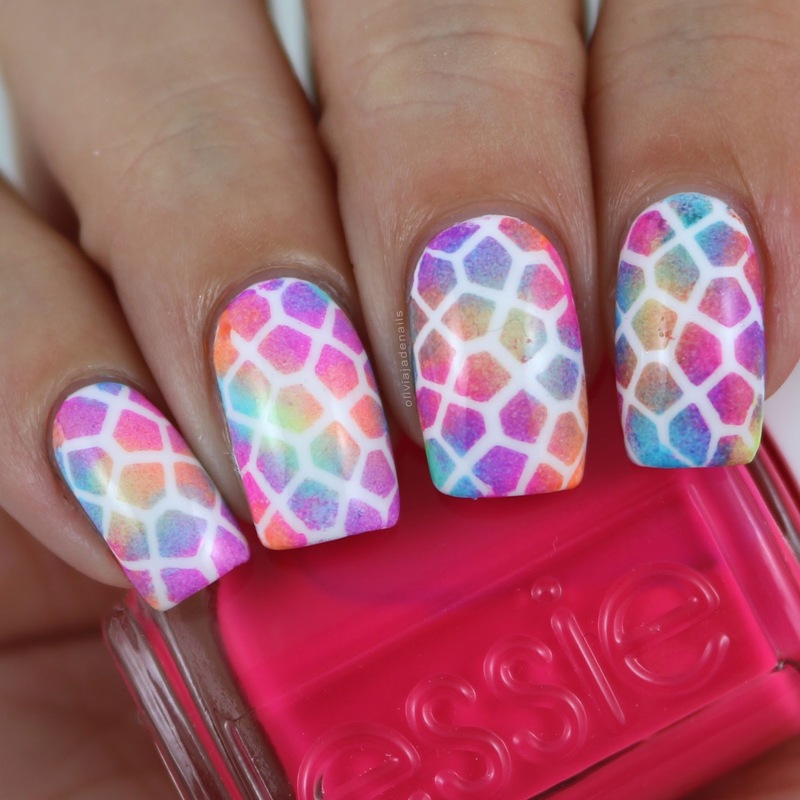 Sometimes you see the perfect mani and you just have to steal it (of course with credit!). I saw this mani by Margaret (@loveslacquer) and I just had to have it on my nails. So glad I did it. 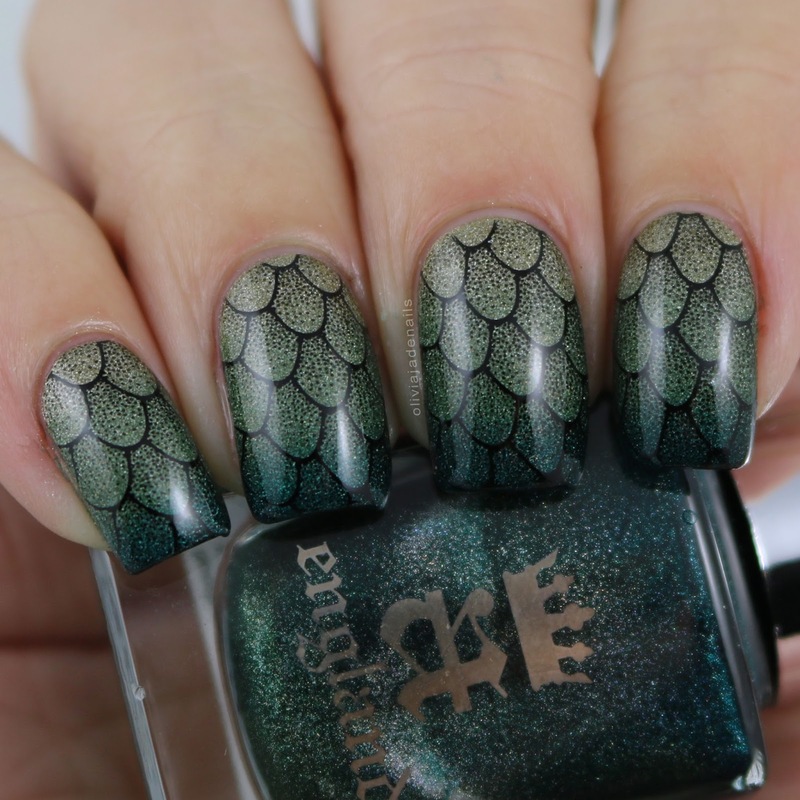 Polishes used are A England's Princess Sabra, Dragon and Saint George and stamped using Powder Perfect's Black Stamping Polish. 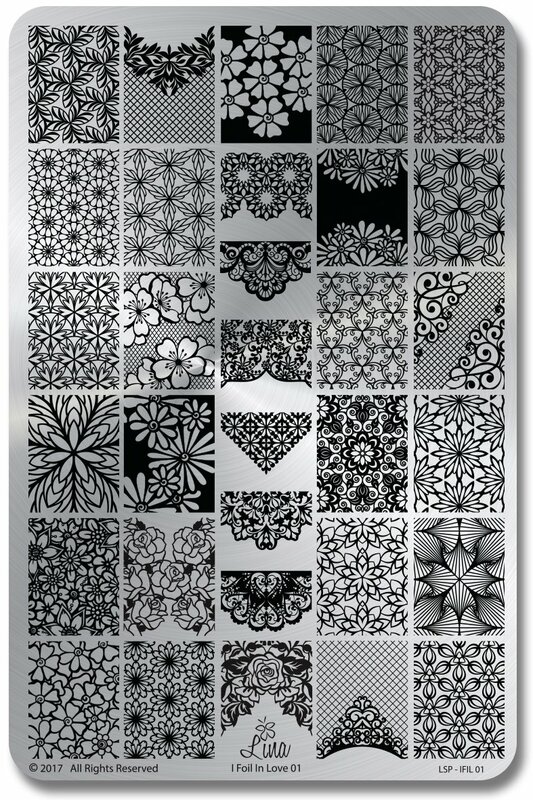 Image is from Powder Perfect's Kings & Castles stamping plate. Did I mention that I have been obsessed with sponged backgrounds this year? This is one of those manis that look better in person. Polishes used are Color Club's Diggin' The Dancing Queen, East Austin and Modern Pink (all from the Coated Collection) and Powder Perfect's Black Stamping Polish. 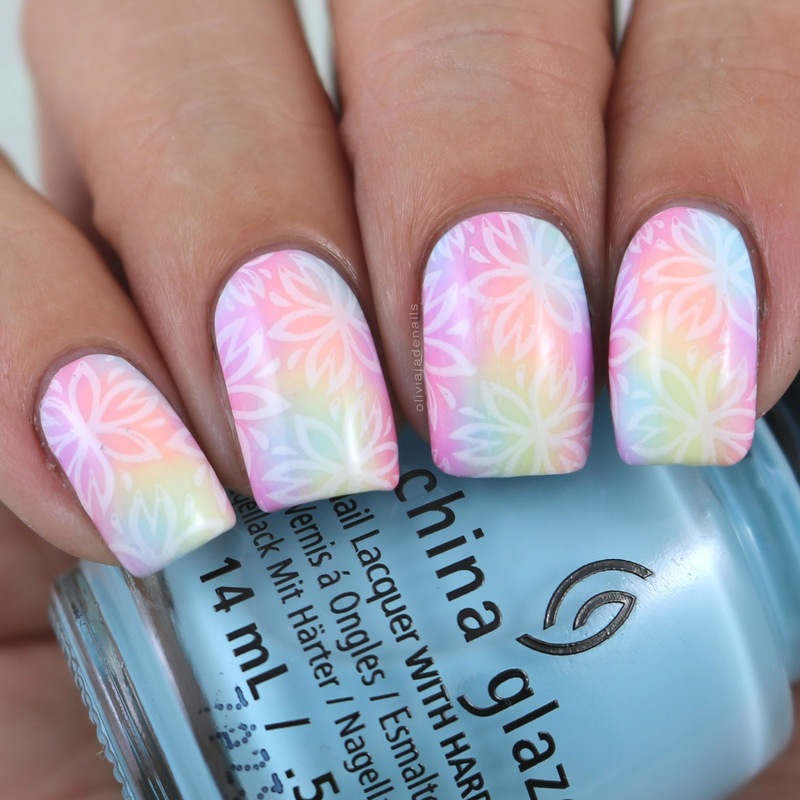 Image is from Lina Nail Art Supplies 4 Seasons Summer 02 stamping plate. If I was to actually rank my favourites I think this may end up as my number one favourite. 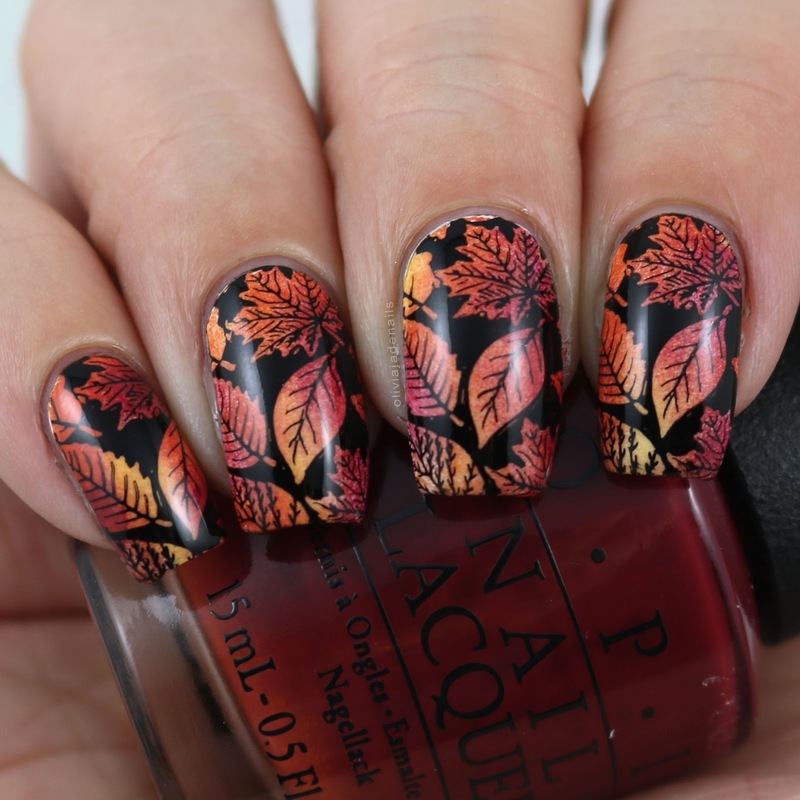 It's easily the best fall/autumn mani that I have ever done, and possibly one of the best manis I have done. For my base I sponged on OPI We The Female, Chop Sticking To My Story and Never A Dulles Moment and stamping using Powder Perfect's Black Stamping Polish. 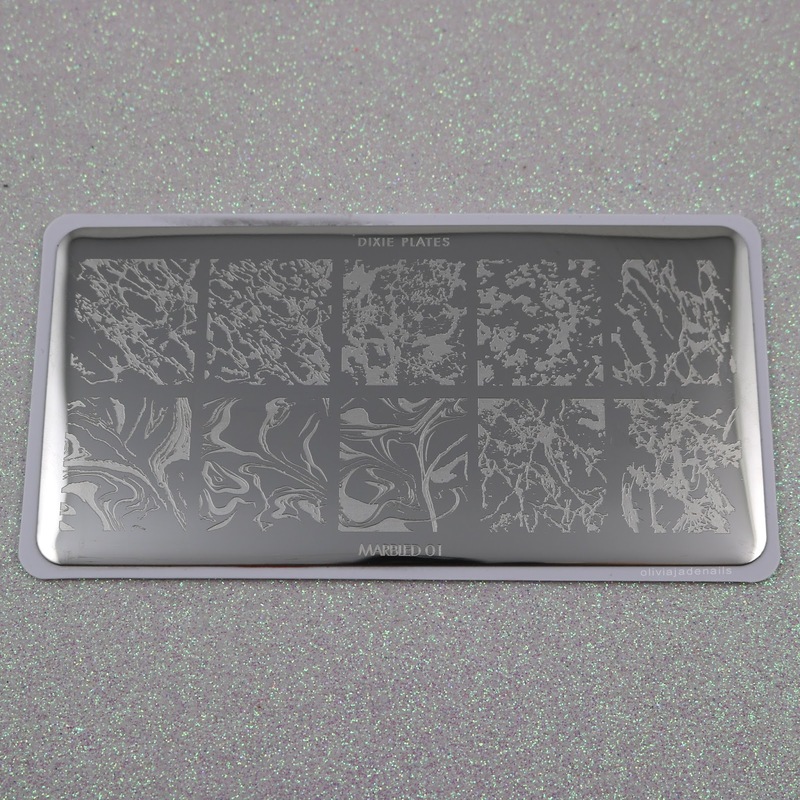 Stamping image is from Uberchic's Lovely Leaves 02 Stamping Plate. This mani is a definite 'me' mani. 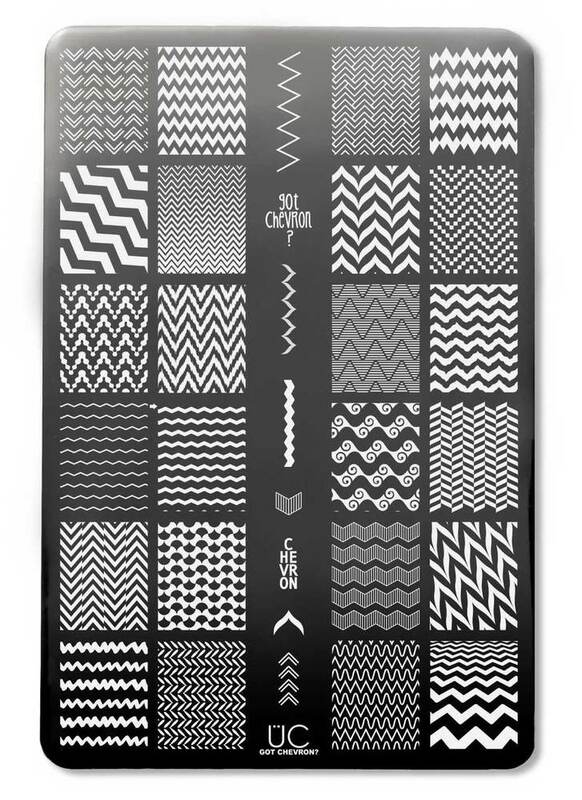 It's got a neon gradient, black stamping and zig zags. For my gradient I used China Glaze Panic Purple and Flip Flop Fantasy, and stamped using Hit The Bottle's Black As Night. 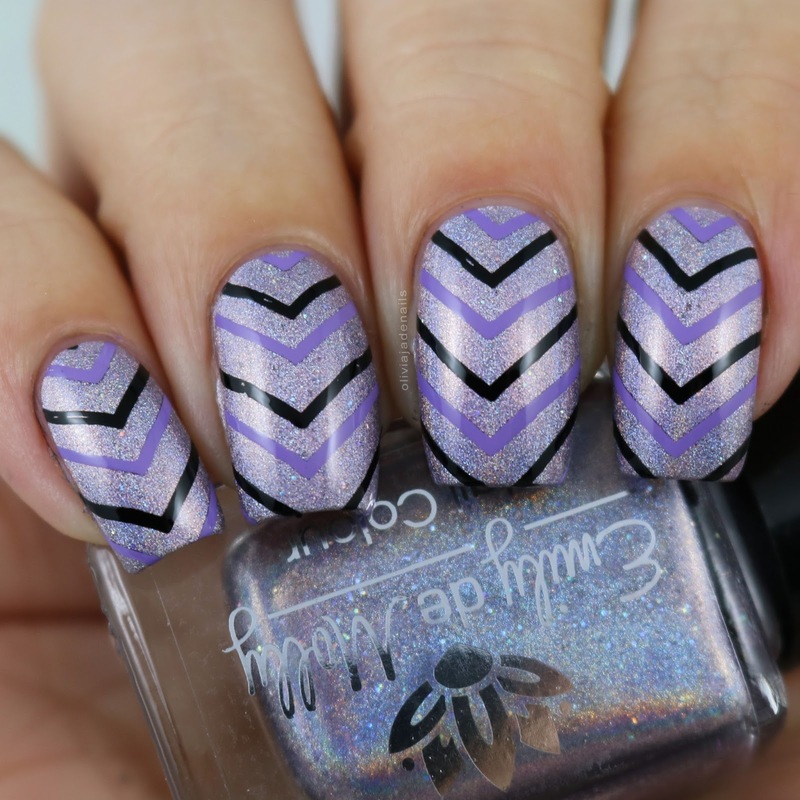 Image is from Uberchic's Got Chevron 01 stamping plate (which is a must have stamping plate). Butterfly nails will also be a favourite of mine and I couldn't be happier that I now have a stamping plate so I don't have to freehand them. For my gradient I used China Glaze's Flip Flop Fantasy, Purple Panic and That's Shore Bright and stamped using Powder Perfect's Black Stamping Polish. Image is from Bundle Monster's BM-S188. These type of designs always scream radial gradients (which I am a huge fan of and need to do more often). Polishes used are Pretty Serious Cosmetics Peachie Poo, Cutie Patootie, and Doodle Bug, and Powder Perfect's Black Stamping Polish. 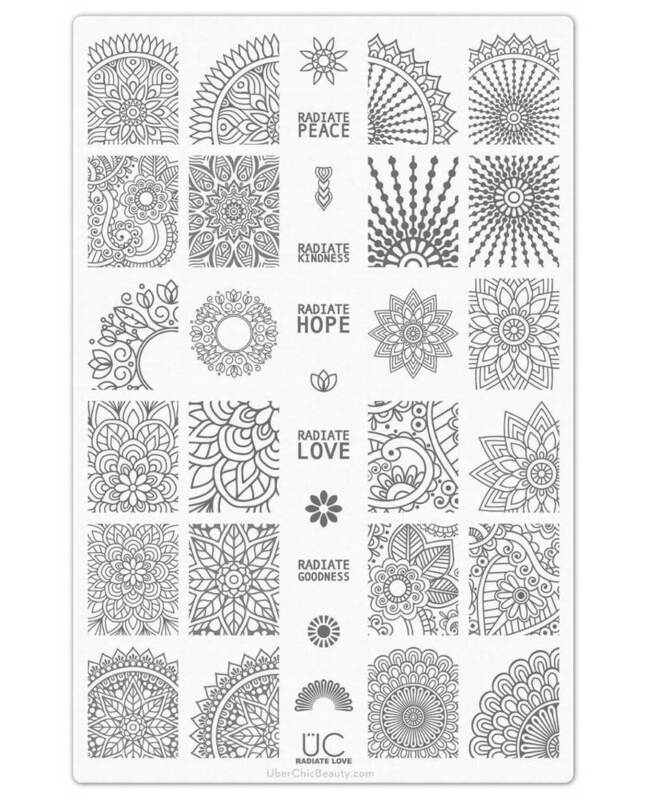 Image is from Uberchic's Radiate Love stamping plate. Stamping has been and probably always will be my favourite form of nail art. It's easy to do, it's quick and the possibilities are endless. Last year, I did two posts for stamping plates and stamping polishes but I am combining them this year. Just as a word of warning this is going to be quite a big post so I will try and keep my chatter to a minimum. 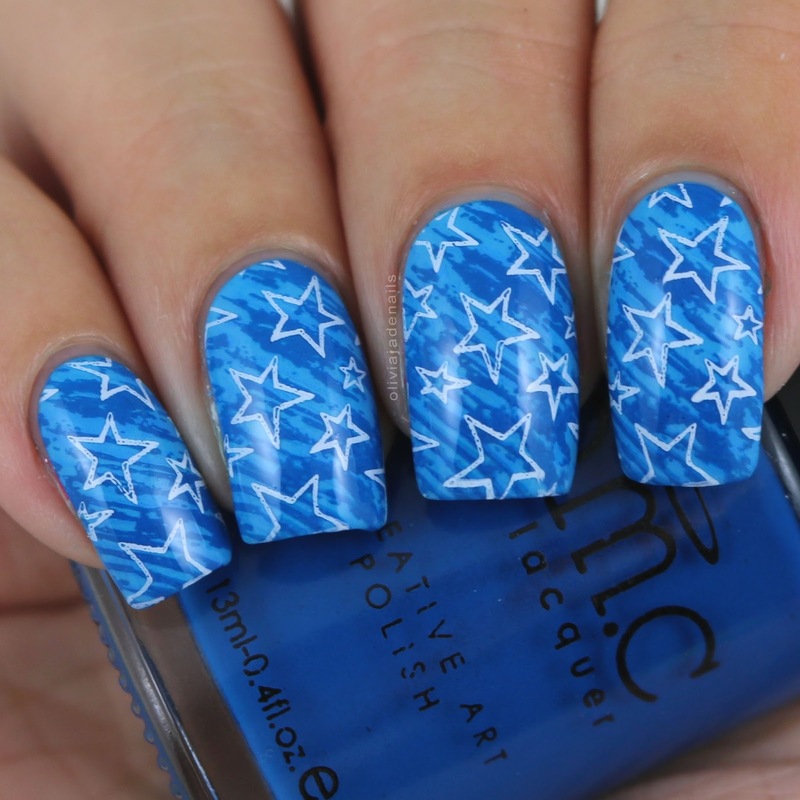 For the most part this year I have kinda stuck to the same sort of brands - Lina Nail Art Supplies and Uberchic Beauty. Both of these brands are my favourite stamping brands and have been for years. I did however, try a couple of new brands (well new to me anyway) which have also made their way into today's post. Like with my other favourites posts these are in no particular order. Dixie Plates are one of the new to me brands that I have tried this year. I purchased a couple of their plates and found the images huge (so if you have really wide and really long nails then this brand may be worth checking out for you). 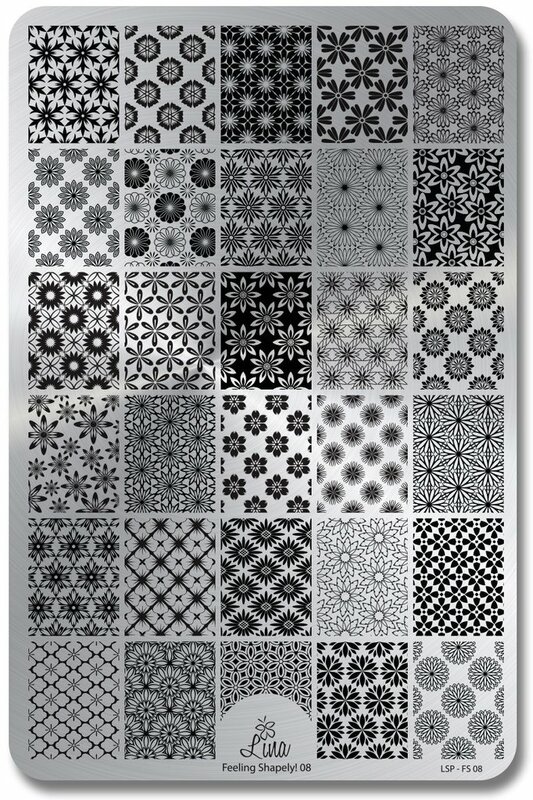 I do love their Marble 01 stamping plate. The designs are cool and it really doesn't matter the size because you can layer them or have different placement on each nail. As I mentioned Lina plates are always among my favourites to use. There are so many good designs. Some of these plates were released this year, however no all of them were. They are just plates that I got around to using this year. This is probably hands down my favourite plate from this year! If I could only use one plate from this year then this would probably be it - but please don't take my other plates away. I love them too! Another new stamping brand for me. 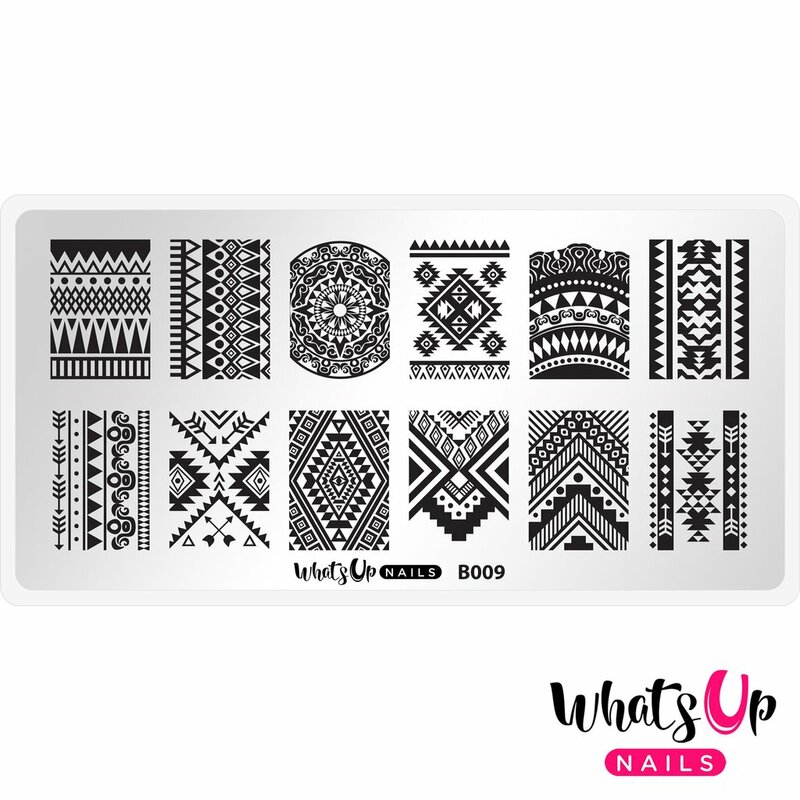 I have previously tried their nail vinyls but never their stamping plates. I am so impressed with the quality and I am a huge fan of their designs. There have been quite a few new stamping polishes that have entered my collection this year and honestly I love them all. The colours have been gorgeous and they have all stamped perfectly. Rather than mentioning individual colours I thought it might just list the brands of stamping polishes that I have loved this year. I have only tried four of their polishes but I am so impressed. They are definitely on my list of things to buy. I LOVE Hit The Bottle stamping polishes. They have such a massive range of colours and they stamp perfectly. 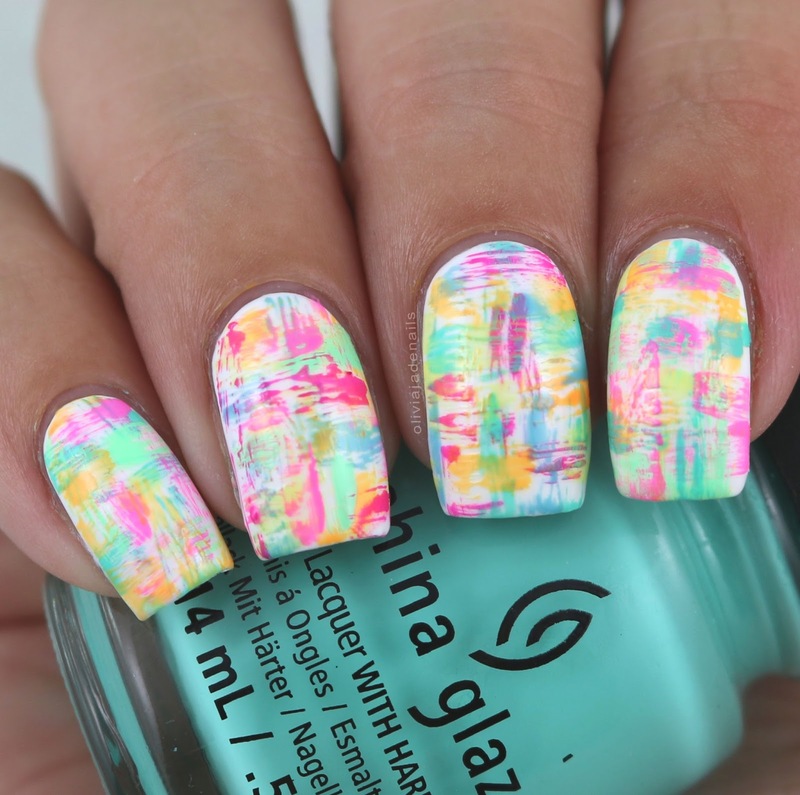 I particularly love their neon stamping polishes! Powder Perfect haven't really realized too many new stamping polishes this year but the ones they have are so beautiful. I particularly love their pastel pink and lilac. 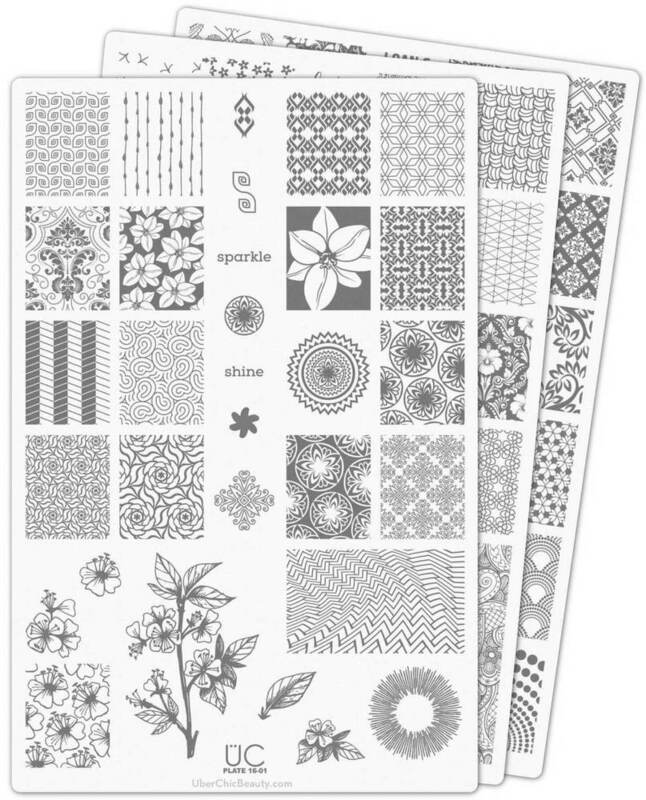 I thought I would throw this extra category in because this year I fell in love with two new stampers - Clear Jelly Stamper's Big Bling and Hit The Bottle's Double Shot. 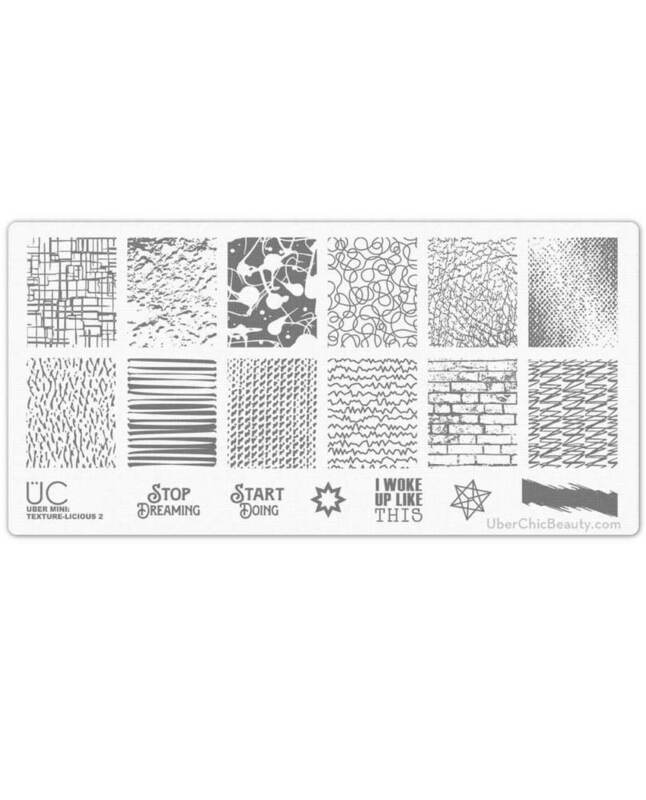 OMG if you are in need of a clear stamper then I highly recommend both of these stampers. Right that is all from me today. I hope you have enjoyed today's post (and all of my other favourites posts). Let me know what stamping products you have been loving this year - or anything else I need to try. Today I have a new sort of favourites post for you. 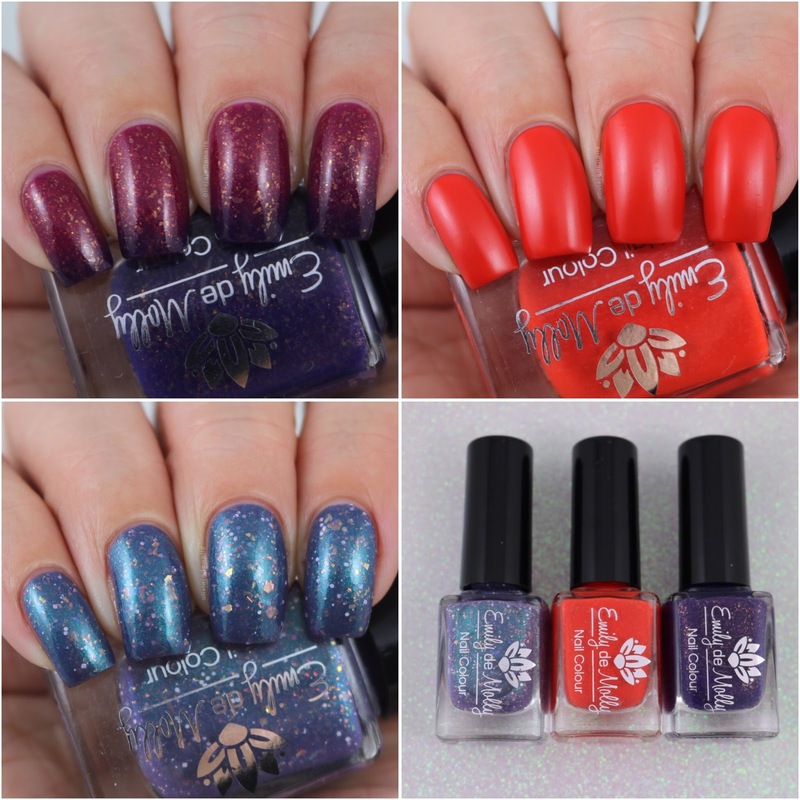 Last year I did stamping plates and stamping polishes as separate posts but I think they can go in the same post this year (which will be tomorrows blog post). 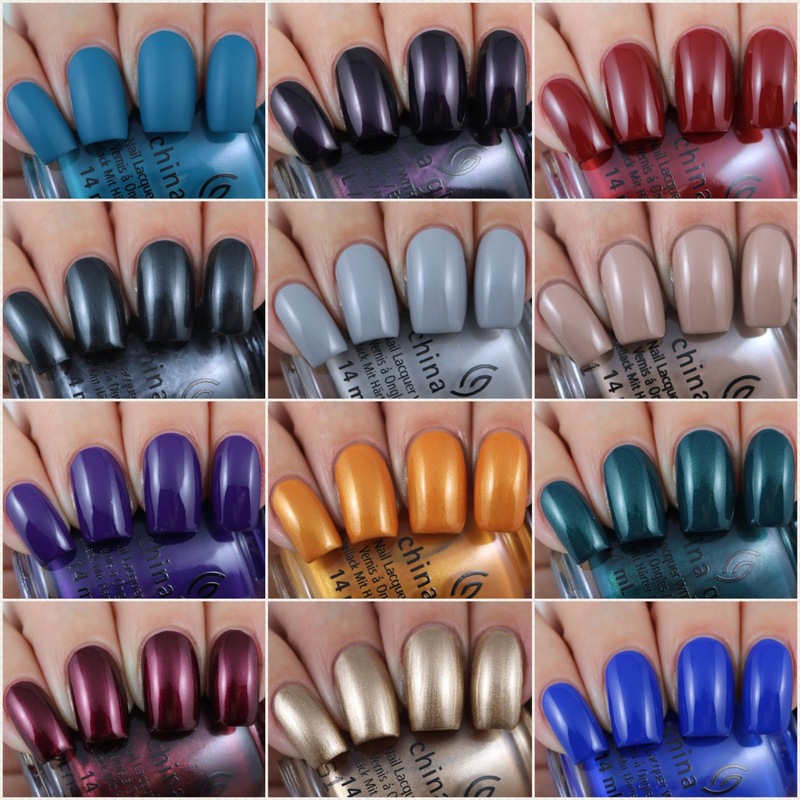 I also found that I have quite a few collections that I love and really struggled to pull out the individual polishes to add to my mainstream and indie polish posts - so a favourite collections post is a must! I should point out that I could have probably added more collections but for the most part I was able to pull out some of the polishes so I have skipped over them to save doubling up. I hope that makes sense. I love ALL of these polishes. They are all so stunning. If you want I think of the individual polishes you can find that here. Clearly I am not that only one who loved this year's Fall Collection. This post is now my most viewed blog post ever! Yes this collection claims to be a one coat collection, which is what initially drew me in, but sadly they aren't one coat polishes. They are, however, gorgeous colours and do have better formulas than some of the original formulas so that is a huge win in my books. I have wore quite a lot of these a few times since owning them. I raved about this collection a lot throughout the year and I still love them now. 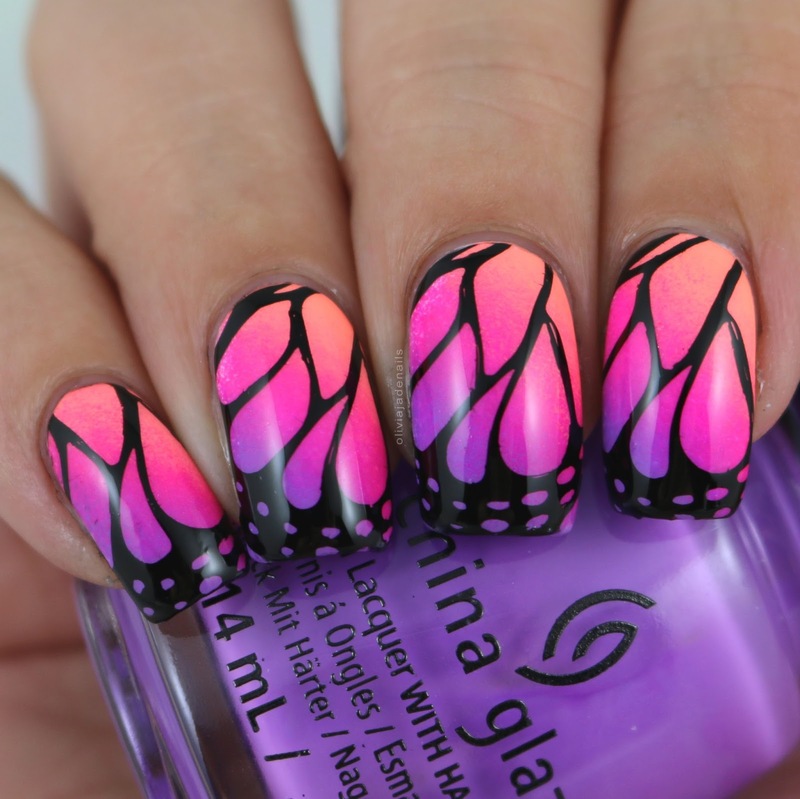 They are such great colours and make for great nail art. Ok I lied - I wasn't going to include any polishes that I had used in my other favourites post but it seems really wrong to skip over OPI as it is one of my favourite brands. While the formulas across this collection were inconsistent I am a huge fan of all of the colours. This is an awesome collection. I know I ended up cutting a lot of these polishes out of my mainstream favourites post but there are so many great polishes - and I love this collection as a whole. 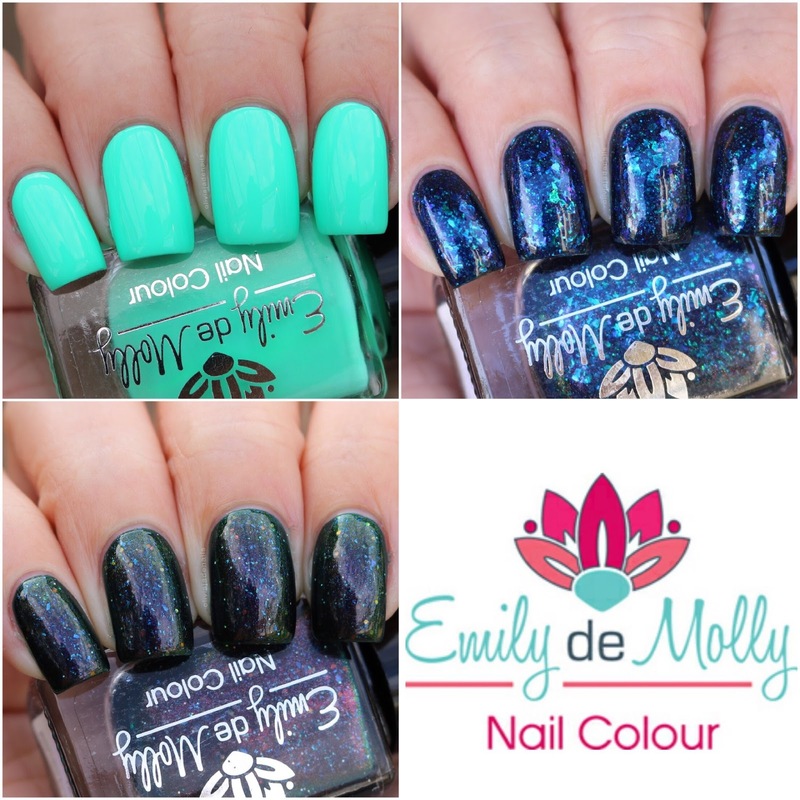 I know I mentioned this yesterday but Emily de Molly really killed it this year with their releases! I can't believe that EdM has celebrated five years of polish making this year. And what a way to celebrate. I love all three of this polishes! Seriously gorgeous! 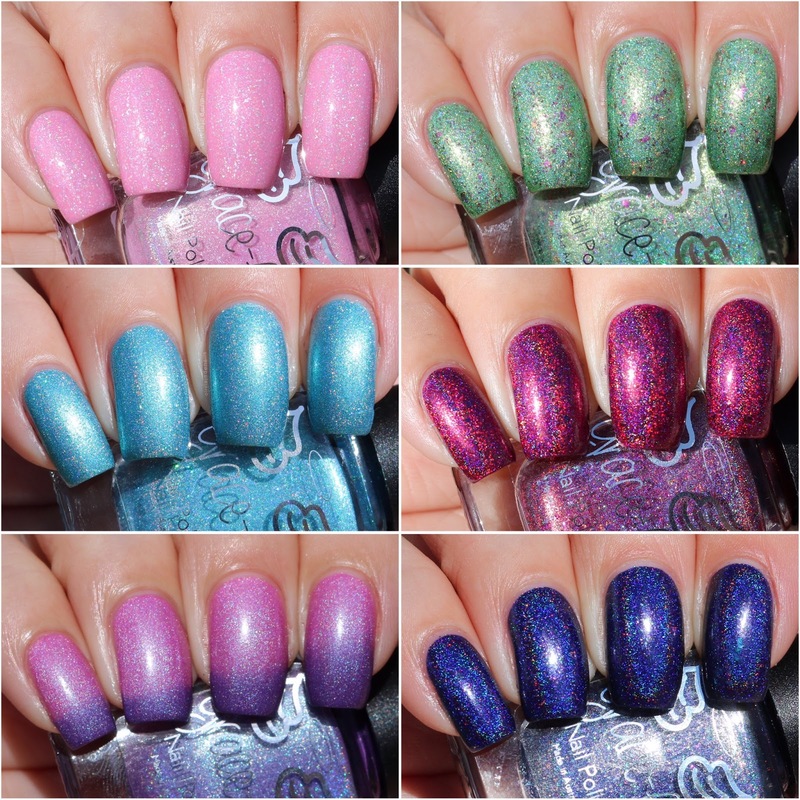 Aussie Indie Con produced some of the most stunning polishes this year (you will see more further down in this post). I love Halloween polishes. EdM definitely have my favourite Halloween polishes from this year. I know a lot of people think that cremes are 'boring' but I love them. I love them as a full mani and I love them in nail art - so when Hayley released cremes I knew that I was going to be a huge fan. The formulas are perfection! 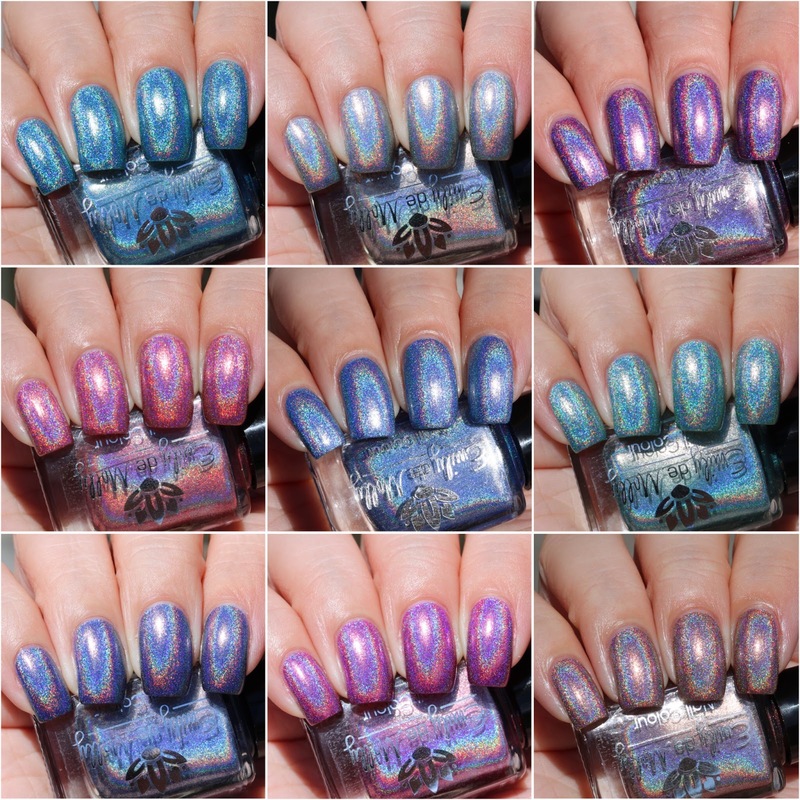 Who doesn't love holo polishes? The colours of all of these are amazing and the formulas are awesome. We all know that I am a sucker for anything flakie and both or these polishes are amazing. As I mentioned earlier, Aussie Indie Con produced some awesome exclusive polishes. Grace-full did some stunning exclusives. Cremes and rainbow coloured? Yes please! I have had so much use out of these polishes this year, and I imagine that I will keep using them over and over next year too. I love this collection (obviously - this is a favourites post after all). The colours are all so beautiful and the formulas are fantastic. When I wrote my review for this collection I wrote that this is probably my favourite collection that Grace-full have ever released and I stand by that statement to this day. These are all amazing! This year has definitely been an awesome year for polishes. There have been sooooo many gorgeous polishes and collections, it really has been close to impossible for me to pick my favourites. It was definitely harder this year to decide than last year that's for sure. I am excited to see what comes out next year.